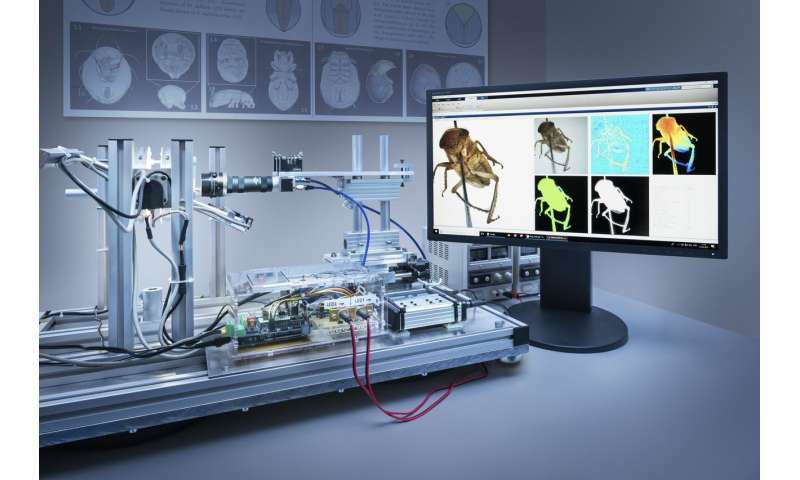 A scanner developed jointly at TU Darmstadt and Darmstadt University of Applied Sciences enables automated digital archiving of preserved insects—in high-resolution and in 3-D. The scientists have published this new and unique development in the journal "ZooKeys." A tremendous decrease of insects has been observed in the last decades: Some native protected areas have lost 75 percent of their insect biomass. The documentation and understanding of the local and global diversity of insects is thus a particularly urgent concern. For this purpose, scientists from Darmstadt University of Applied Sciences and TU Darmstadt have jointly developed a novel scanner that digitises preserved insects in high resolution and to scale. The scanner should make a valuable contribution to the digital documentation of biodiversity. Because even preserved insects in collections are in danger: They are threatened to be gradually lost due to natural decay and pests such as the museum beetle. Over one million of different species are archived in natural history museums – a substantial number. Digitisation makes it possible for them to be not just preserved for the future, but also to be accessed online worldwide. The group "Ecological Networks' at TU Darmstadt investigates the influence of land use and climate change on species communities and morphological characteristics of insects and arachnids. Although there are already numerous photographic documentations of insect collections, the reduction of the three-dimensional animals to two-dimensional images is extremely unsatisfactory. "Single images make it impossible to see all the important characters, and the spatial relationships of certain characters cannot be displayed," explains ecologist Michael Heethoff. A 3-D insect scanner was therefore needed. Here, Bernhard Ströbel from the Department of Mathematics and Natural Sciences of Darmstadt University of Applied Sciences came into play with his many years of experience in the field of optical 3-D measuring. The joint development of the "DISC3D" (Darmstadt Insect Scanner 3-D) device took four years. The prototype is now in routine use and optimised for largely automatic data acquisition. For the scan, a pinned insect is mounted in the centre of two hemispheres, which indirectly illuminate the specimen on all sides. A motorised sled moves a camera back and forth as it continuously takes pictures. The insect is rotated by stepper motors at regular intervals around two axes to allow imaging from all directions. This results in about 25,000 digital single images, combined from 400 different spatial directions. 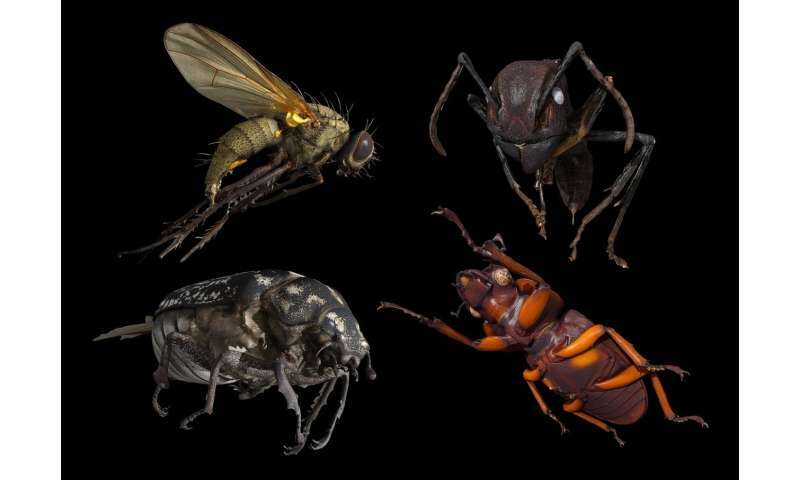 Three-dimensional models are then generated from these 400 images, to which the photographic surface (texture) of the insects is digitally applied. The results are true color, scaled 3-D models of the animals that can be viewed, rotated, zoomed, measured and curated in databases in museums. "The scanner can image insects of most sizes in its current configuration, from small flies of two millimetres to animals the size of a cockchafer," says Ströbel. The models can be enlarged and printed with a 3-D printer, which is also of interest for instance for museum education. Some museums and research institutions have already expressed interest in the scanner and have started to build replicas. Although the device currently uses also commercial software, it is in principle designed as an open project that can be realised inexpensively by interested parties themselves. The developers are hoping for numerous imitators, including private individuals, so that the goal of a large-scale digitisation of insect collections at the museums could be achieved. Interested parties are provided with the construction plan of the device on request, and participation in the further development is anticipated in return. The joint initiative of the two universities is an example of how interdisciplinary cooperation opens up new fields of application for digitisation. Darmstadt, the winner of the "Digital City" competition in 2017, the Technical University with its central profile area "Internet and Digitalization" and the Darmstadt University of Applied Sciences with its study area "Optical Technology and Image Processing" provide ideal conditions for the ecologists' aims.